Lots of my favorite things going on here :: a covered bridge, a bow necklaces, and a bird dress. First, this colorful bird print dress has been on my watch for awhile, but the moment I saw it go on sale, I was anxious to get home and purchase it right away. Everything with animals on it, all of the time, am I right? I was venturing down towards this park to go to an abandoned gas/service station, but it really wasn't as cute as I remember it being when I first drove past it. So I made a turn on a side street near the park and noticed a weird barn like structure -- which ended up being this covered bridge! Sometimes I really do love Harrisburg for the plethora of little photographic gems it has. 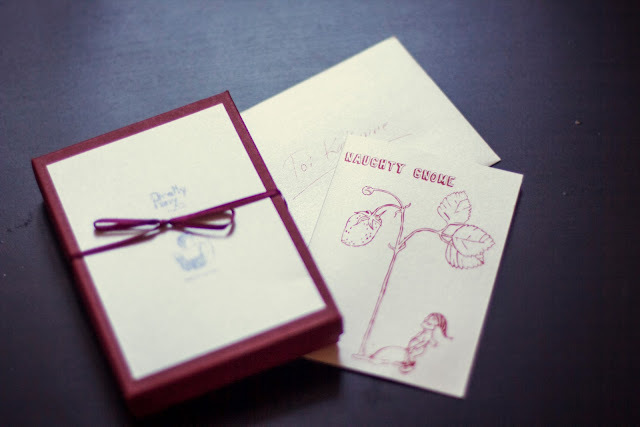 Last week I came home to an adorable package from Anya of Pretty Pany in my mail - I loved the little card and packaging of this adorable necklace. I can't stop wearing it. I really love independently designed things - I love knowing someone made the thing I am wearing and that it's a different (and a lot nicer!) than some cheap nickel necklace from Forever 21. Basically I'm in love with this thing! Also - get excited - Anya and I will be doing a giveaway later this month! Beautiful outfit! Of course, I love that printed dress, the colours are gorgeous. I adore knits caps. I concur I love independently owned everything personally. I love just knowing as a consumer I am helping out an small business owner! :) I love this dress on you, fits you perfectly. Its like it was made for you! AND I love that hat! katherine, you are killing me with all of these cute clothes you wear! i love THIS dress. the different color birds are awesome and you can pair it with different color cardigans. so cute. how fantastic is that bridge and it's message!!! i'd walk through that sucker everyday! hahahahahaha fabulous post girl. hope all is well. Oooooh I love all the birds here! Your tatoo is gorgeous! I also love your hat! Too cute Katherine! I love that Anthro dress; every single thing you are wearing highlights its great structure and print. Love the scarlet beret, too - and those covered bridge pics are seriously beautiful. I adore your cute style and your tattoo is awesome! You're killing me with these adorable animal print dresses, I want all of them. This dress kind of reminds me of your Modcloth ice cream dress, which I also have an obsession with. 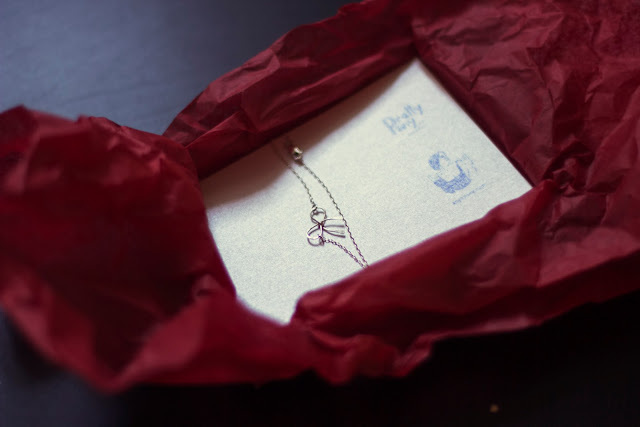 Also, I'm looking forward to this giveaway, the necklace is lovely! Oh my goodness! Love the print on your dress. When I went to read where your pieces were from I exclaimed, "Of course it's from Anthropologie!" Such a cute dress! A great print. And I love the little bridge you found. I wish I had cool places like that near me, or that I put in the effort to hunt them down. I just love this dress on you. The different colour choices you've made with the yellow and raspberry are so perfect! If you took these photos on your own you are a real wizard. They turned out amazing! thanks! i did take these myself - it was hard to get the bridge in frame! love your outfit, the beret colour is beautiful too. and your tattoo is so awesome! I seriously adore your entire outfit- especially the cardigan and beanie! I'm hoping to have more mustard and burgundy/red pieces in my wardrobe this fall. That bird dress is just too cute as well! I love the covered bridge quote- that is so neat :). Have a lovely weekend gorgeous! The more woodland creatures the better, as far as I'm concerned! Love that necklace too, so cute. Yellow and red! one of my fav color combinations.. i love all the BIRDS on your dress! It's amazing! Beautiful photographs! I am so excited my necklace put a smile on your face... It is in my mission statement: putting smiles on people's faces! you are too cute! i love that necklace, and i love your whole outfit. that dress is so pretty on you, i love the hat, and your tattoo is adorable! and that bridge...how cute is that? Love your hat and your tattoo! Have a lovely weekend! First of all - LOVE your tattoo (I'm not usually a tattoo fan). Also, I guess I must take a road trip out to Harrisburg some time and see some of these photographic gems! What a cool bridge! I love the mustard cardigan with that hat! I was eyeing that beautiful bird dress for a while, but didn't end up getting it. Totally regretting it now! This is one of the prettiest bird brings I have ever seen! I love all of your bridge shots, and that necklace is SO cute. I am right there with you on the independently made things, its definitely worth a few more bucks for it to not turn your neck green or turn different colors like the cheap pieces do! Definitely looking forward to your giveaway later! SO SO SO cute. I love this dress on you and the way you styled it works so well! I absolutely adore your dress! You look so great. I love how you styled it with a beanie. Great look. That necklace is adorable! I am excited for your giveaway! As always, you are so pretty and your style rocks! And your hubby is a great photog! I love the saying on the bridge. That is really cute. Also your dress is adorable. I don't think I have any animal printed type of clothes at all. How nice to receive packages like that in the mail!! Your birdies tattoo is so pretty. This outfit is adorable and so fabulous. The colors, the shapes and fabrics--all perfect. I especially love the pattern on the dress. So retro! This is such a truly, truly lovely outfit. The thing that takes it to the next level though has to be the hat! Love it. Also- very jealous of the bridge. I've always wanted to see one. They look like fun! That bird dress is so cute and very you :). I love how you paired it with a mustard cardi. I wish there were covered bridges here in LA. We may have great weather but not a lot of character. Great photos! Love the tattoo. You have the cutest clothes. Thanks for stopping by my blog today! :) It is awkward talking to Disney characters. LOL Glad I'm not the only one who thinks so. I'm usually not a tattoo person, but your tattoo is by far the cutest one I've seen. I approve! That is one of the prettiest dresses I have ever seen!! The print is just so lovely- anthro always has the best prints! Amen about F21 jewelry! You look wonderful and I love the location. I'm off to check out that jewelry website! i love your tattoos and those pumps are GREAT!!! you look amazing as always! Hi! Thanks for stopping by my blog and leaving a comment. That work out session you shared was AWESOME, loove it! I will be going it for sure when I get back to "sporty mode". did you a little shout out on my latest blog post, hope you get some visits from there!! happy to have found your blog and happy to be yoru newest follower. Birds scare me in real life but loving them on this dress! And the hat and shrug, too too fanastic! Beautiful! I need your entire outfit...but mainly that dress! Amazing dress! I think the bird print is so totally sweet! Cute cardigan too!